August 3 is an important date as it is your induction into the Pro Football Hall of Fame. John, you know how I feel and I want to formally welcome you into that small family of professional football players who were at the top of their game. 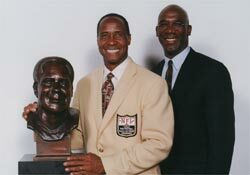 Lynn Swann selected John Stallworth to be his presenter in 2001. You have been deserving of this for a number of years, and I believe that you demonstrated early on in your career the ability to be one of the best wide receivers in the National Football League. Your induction into the Hall of Fame says just that: You were one of the best of all time. You and I came into the National Football League together in 1974. You were drafted in the fourth round and I was drafted in the first round. Instantly, I saw that you were a dedicated receiver and that you were willing to prove yourself and make sure you made that football team by being totally prepared. In fact, you were much more prepared for our first minicamp than I was. You showed me right away that it was about being prepared, working hard and taking advantage of an opportunity. "Your major strength as a football player was your competitive attitude. Your desire to be the best and do all the things you had to do to get to that level." When we were rookies together, I remember sitting on our helmets watching the first quarter of a football game, before getting into the game in the second quarter. And you and I would always talk about the game, what was going on, different perspectives on the game -- so that when we got into the huddle for the first time, we had a gameplan. We knew how the defense was playing and found ways while watching the game to take advantage of that secondary. We pushed each other. Your major strength as a football player was your competitive attitude. Your desire to be the best and do all the things you had to do to get to that level - by being in shape, studying the game, by understanding how it should be played, technically as well as artistically. Then going out and analyzing the opponent - looking for the small details that would allow you to beat your man. Those are great assets. I recall a game in our second year - the AFC Championship Game against the Raiders. I was injured and out of the game. 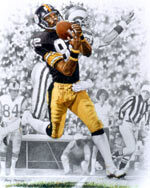 Franco Harris got the ball on a sweep around the left end. You came in on a crackback block, and knocked the guy flat on his back - and then kept going and took on another guy. You took both of those guys off their feet. Franco waltzed around the outside on an ice-covered football field and went into the end zone for a touchdown that - no pun intended - iced the game for us. I've seen you make catches, four- or five-yard receptions, and then run through the entire secondary, traverse the field and get to the end zone. Phenomenal. We used to refer to you as being gangly, because it was hard to judge your pace and your speed. But you just made moves, went up for the ball, made great one-handed catches. When they threw the ball to you, we knew you were going to catch it. You'd make that move.